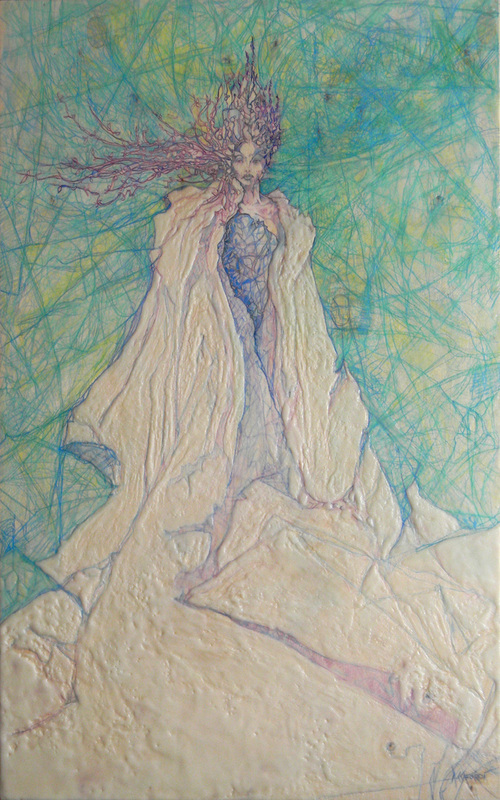 The Protector - 36" x 63" - Coloured pencil and Encaustic. Powerful and in harmony with nature. Inventor - 20"x40" - He is made up of many parts. Linked, connected. One can create just about anything. You just make all the part fit that way. "Arctic Goddess" SOLD 24"x 40" was available at SideStreet Gallery, 264 Main St. Wellington, Ontario. She is a Goddess of Victory. Tree Nymph - SOLD Size: 14" x 28" Graphite & Encaustic. Trees dance in the wind. Imagine if trees could fly? Leap of Faith - SOLD Size 36" x 36" - We all have to take flight at some time. To rip away from the earth and fly from our comfortable world. We find our strength.